If you drive up to Payson from Phoenix and then turn east on highway 60, you’ll climb up out of the low desert onto the Colorado plateau, through cool pine forests and then into the high desert of New Mexico. Eventually you’ll reach the Plains of San Agustin, a flat empty valley ringed by 10,000-foot mountain ranges. It’s mostly sand and grass and endless sky out here, with really terrible cellphone reception. The VLA looming in the background. The lack of reception is intentional: scattered around the valley are the giant white dishes of the Very Large Array, of Hollywood and television fame. It’s located so remotely because the radio noise of human civilization can easily drown out the faint signals of astronomical sources. Even passing car engines and cell phones have turned out to be major interference sources at certain frequency ranges observed by the VLA. 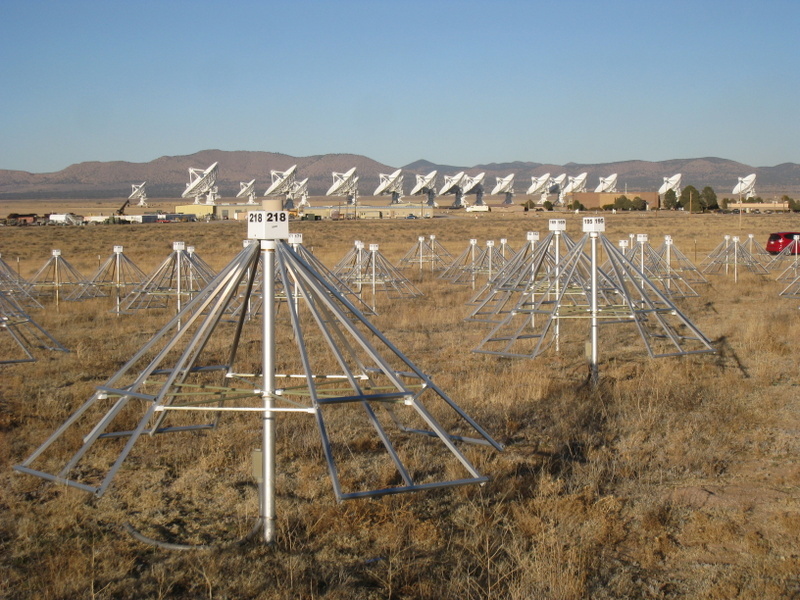 The second half of my PhD research is going to use the VLA, and I’ll talk more about it at a later date. But today I’m going to talk about the first part of my PhD research, which centers on small field ringed with barbed wire, a quarter-mile south of the VLA Visitor’s Center. As you walk up, it looks exactly like someone planted several truckloads of oversized TV antennas in the middle of cow pasture. 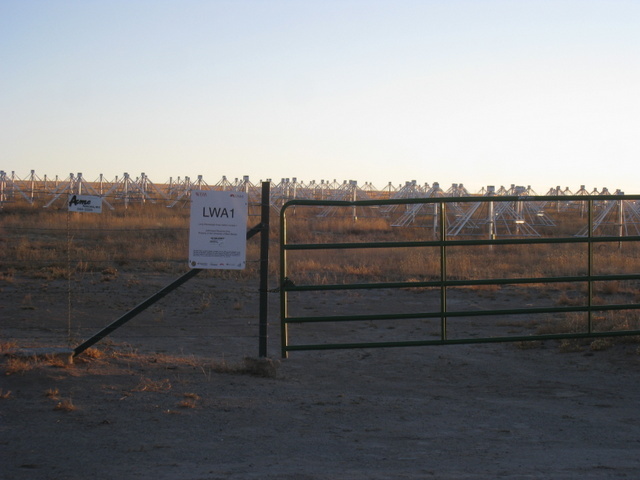 This unsophisticated-seeming array is the first station of the Long Wavelength Array, LWA1, operated out of the University of New Mexico in Albuquerque, and it’s quite a bit more sensitive to longer, meter-sized wavelengths of light(1) than its more-impressive neighbor the VLA. These long wavelengths correspond to frequencies of 30-100 MHz, just below the FM radio band. This frequency, it turns out, is perfect for hunting for the birth of the very first stars. Yes, once a upon a time, there were no stars. In fact, for several hundred million years after the Big Bang, the universe was completely dark and devoid of light except for the fading glow of the Cosmic Microwave Background. Astronomers refer to this period of time as the cosmological “Dark Ages.” The Dark Ages ended when the first stars began to form around 400 million years after the Big Bang, at redshifts of 20 or 40 (2). Artist’s schematic of the cosmological Dark Ages and the epoch of hydrogen reionization. Astrophysical models of the formation of these stars suggest they were very large and very massive, much brighter and hotter than our own sun. These first few stars filled the dark universe with ultraviolet radiation first. At the time, most of the universe was filled with cooling hydrogen gas. The radiation from these stars will have heated the hydrogen, and then eventually ionized it, creating a universe of hot plasma bubbles threaded through with filaments of cooler, denser gas. And that’s what I’m doing with a pasture full of bow-tie antennas in the middle of nowhere, New Mexico: looking for the first stars to form in the Universe. Next time I’ll tell you how I’m going to do that. 1. Radio signals are actually just another kind of light. We can describe light by either its frequency or the size of its wavelength: radio light has wavelengths millions or billions time larger than the light your eyes see. So instead we use antennas to detect it. Typically the size of the antenna tells you about how physically large the wavelength of the incoming signal is. 2. Redshift increases as we look back in time. So smaller redshifts correspond to the modern Universe, while larger redshifts mean that we are looking back to early times, closer and closer to the Big Bang.